We Love Rinspeed! They get it. With more than 35 years of innovations, visions and creations, the company has challenged us and never fails to think outside the box, sometimes so outside the box it is often brushed aside as too far out. And Rinspeed’s microMAX EV is no exception with all the making of a futuristic people mover and what mobility will surely look like. This little EV is about small city hops, almost standing up, little energy, light and efficient. After all, isn’t that the promise of the future? The Never Ending Flow From The Rinspeed Think Tank. The Swiss automotive developer and genius behind some of the most unconventional concepts and prototypes is showing yet again a preview of its latest research, an all-electric urban vehicle it will unveil at the 2013 Geneva Motor show. The microMAX is no ordinary electric vehicle as we’ve come to expect from Rinspeed since it is squarely intended for short ride sharing and keeps passenger upright, virtually. 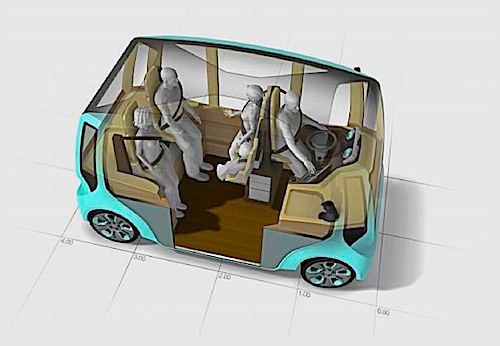 Rinspeed wants people to think of traveling more as passengers than just starting our own cars, putting that gigantic gulp size pop or coffee cup in a holder with other abundant amenities and over the top, heavy leather seats. In many ways, it’s a smart way to reduce our carbon emissions, alleviate urban congestion and bring about efficient transportation to the mass. Just don’t take sharp turns with it! Future Mobility Trends. You guessed it, the future of mobility is looking more and more as having the following key ingredients. It will have an electric drive of some sort, it will be light, yet sturdy, it will be highly energy efficient and will have smartphone capabilities operating it. In this instance the microMAX has all the key ingredients and hints more and more at a fully integrated futuristic mobile platform. Gone are traditional cars, this is about mass efficient mobility. It’s All About Dimensions. And yes, size does matter but this time, small on the outside, spacious on the inside is what we’re looking for here. With its tiny length of 11.8 ft, about the size of a BMW Mini, this EV stands tall at 7.2 ft. It will intelligently accommodate space for busy urbanites and their carry-ons, such as shopping bags, strollers, luggages and even suitcases. Most of us joke about how modern cars do everything but coffee but coffee these days. Fear no more, the microMAX does that and more. Yes, it will pack a coffee maker but also a refrigerator! What really stands out is it will have unlimited connectivity features, making this futuristic EV an intelligent means of locomotion. prescience look into the future. After all, the new generation of drivers don’t care what they drive as long as their connected lifestyle is not impaired and their thumbs are near their smartphones. In many ways, Rinspeed’s microMAX all-electric people hauler has all the key ingredients of this future of mobility we are being teased with, even if looks, shapes and over aesthetics will keep us talking for a long time. Looks like an even style-less version of those horrid micro buses that are popular as taxis in Japan. You're right, it did remind me of something but I couldn't put my finger on it. In many ways, it looks like something Kubrick would have put in 2001: A Space Odyssey.